Not only in the gaming sector but also in professional CAD/CAM applications does performance play an important role. Obviously, the performance-independent expectations of users on an adequate notebook differs considerably from gaming devices, which is why the leading business notebook manufacturers have their own series for this target group in their repertoire. 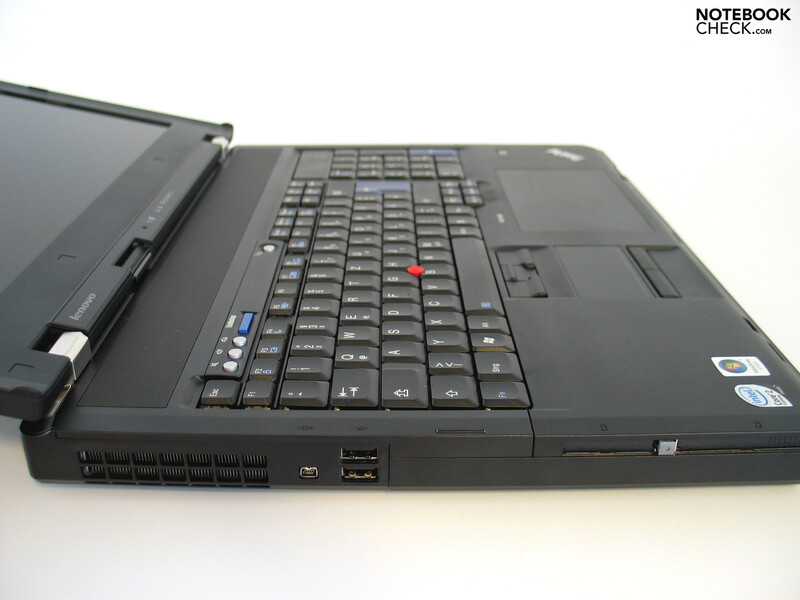 The Thinkpad W700 with a Quad-Core CPU and Quadro FX 3700 graphic is the flagship device from Lenovo. 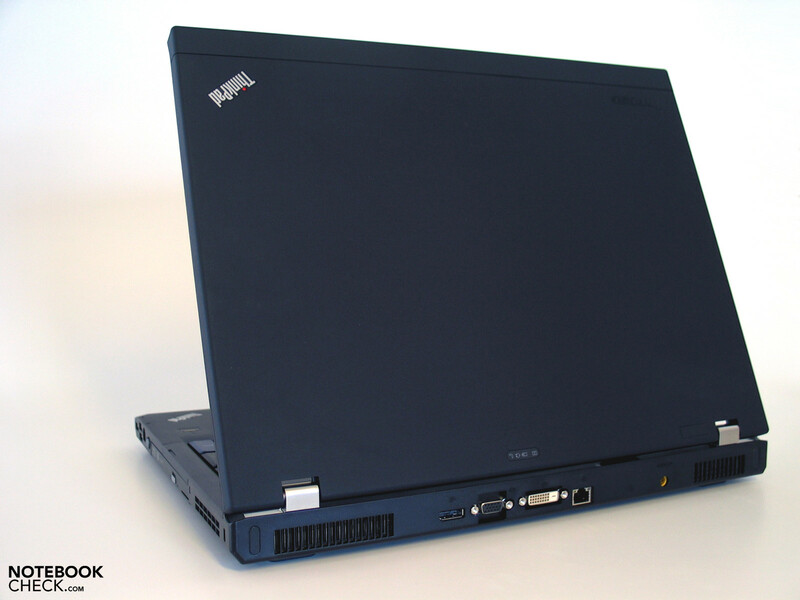 After the test of the Lenovo Thinkpad W500, the little brother of the W700 in a 15.4 inch format, equipped with ATI FireGL V5700 graphic and Intel Core 2 Duo processors, we also finally had the pleasure to check out the 17 inch workstation series very closely. Up till now there are two model variants available, aside from the individual configuration possibilities of the single hardware components. On the one side the classic workstation labeled W700, optionally equipped with an integrated Pantone Color Display calibrations device or an integrated graphic tablet from Wacom and on the other a model with fold-out 10.6 inch additional display labeled as W700ds (dual screen). 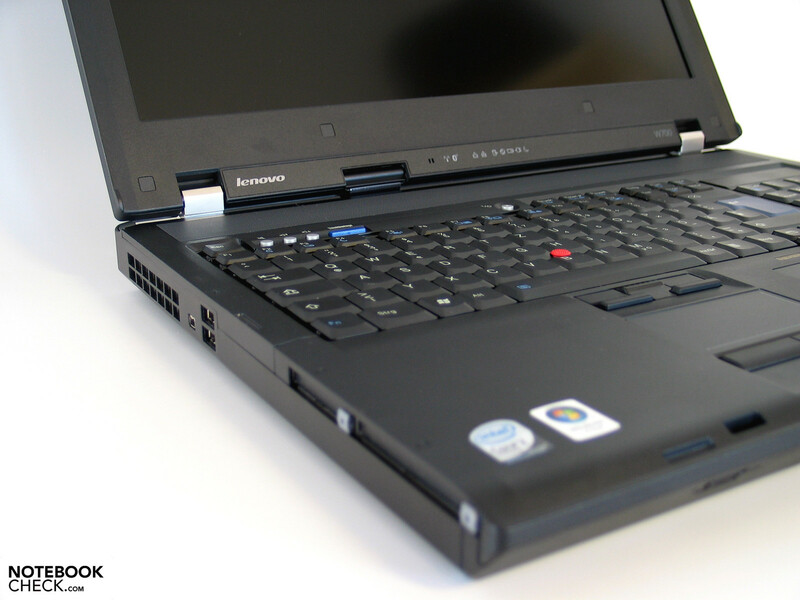 The following review handles both models, the Thinkpad W700 as well as the W700ds, fully equipped with a graphic tablet, calibration device and an Intel Core CPU in connection with an efficient Quadro FX3700M graphic. 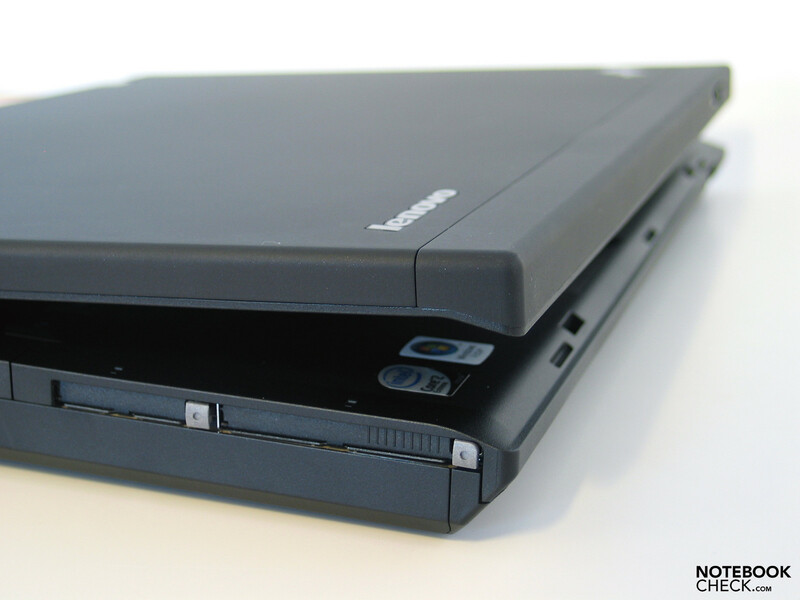 The argument that notebooks simply need less space on a desk than the common desktop PCs can only be applied to an extent in the case of the Lenovo W700. The device measuring 41x31 centimeters claims 0.13m2 of your valuable work space. The mighty power supply shouldn't be underestimated either, coming severely close the weight of compact netbooks with 970 grams. 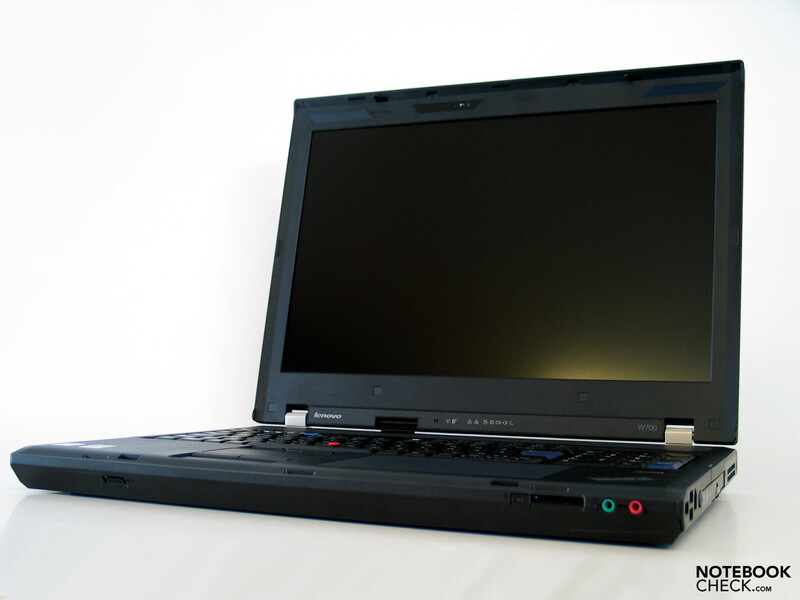 We think that the weight of the notebook (W700) turns out to be less dramatical with 4.14 kilograms. Thinkpads and design are just about as compatible as Lara Croft and Manolo Blahniks. Anyway, the, let's call it Thinkpad "anti-design", has already almost reached a cult status on the notebook market. Principally, it's said that "less is more" when it comes to pro-notebooks, at least what the design of the notebook concerns. The completely black case is affected on the insides and outsides each from a Thinkpad lettering, there where once the "handsome" IBM logo was stamped. Petite accents are set through the massive metal display hinges, as well as a few blue keys or rather key-lettering in the applied keyboard. In view of this optically defensive surrounding, it's easy for the red trackpoint to operate as the eye catcher of the whole device. 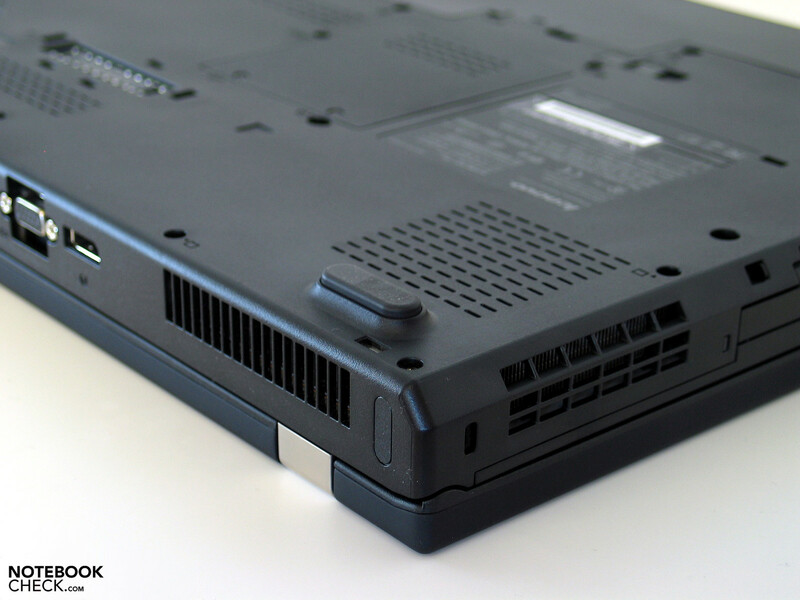 While for the smaller models in the Thinkpad range often high quality materials, like magnesium, are applied, you are primarily confronted with plastic surfaces on the Thinkpad W700. Only the display lid was given a stable metal casing. 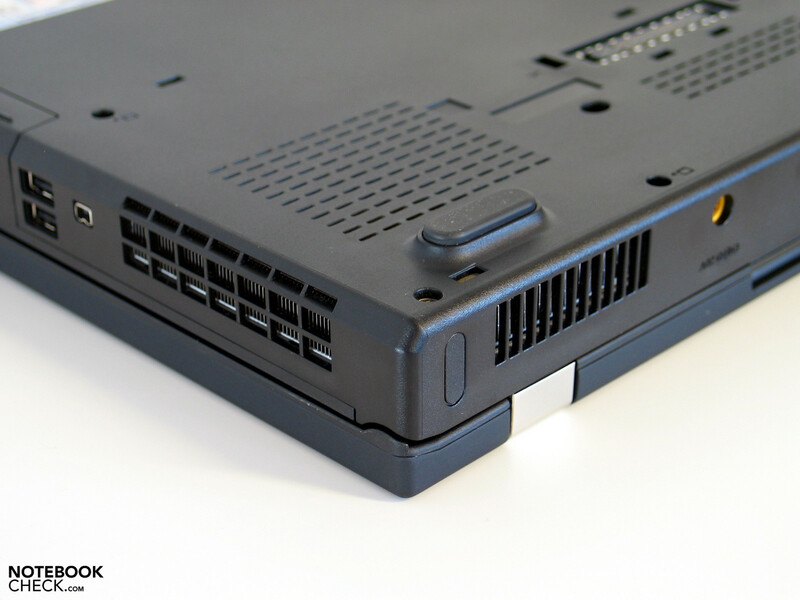 With this, the screen attains the Thinkpad-typical stability, which even allows a picking up of the 4 or 5 kilo Thinkpad with an open display without any problems. In regards to this, both massive hinges are, of course, important, which like in the good old IBM times provide for a permanent, teetering-free fixing of the display. 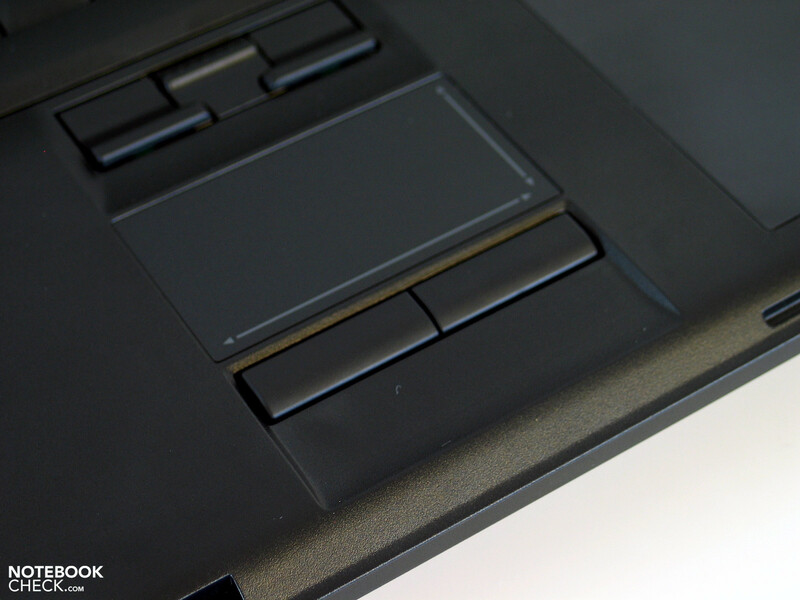 The plastic components of the base unit also give the notebook a sufficient stability, though. Responsible for this: A cleverly devised magnesium frame in the inner of the case. But we could also observe in places slight deformations of the outer skin (for instance in the area of the Express/PC – card slot or the graphic tablet) under point pressure. Since the W700 will mainly be used on a desk, this weak point can be described as bearable. 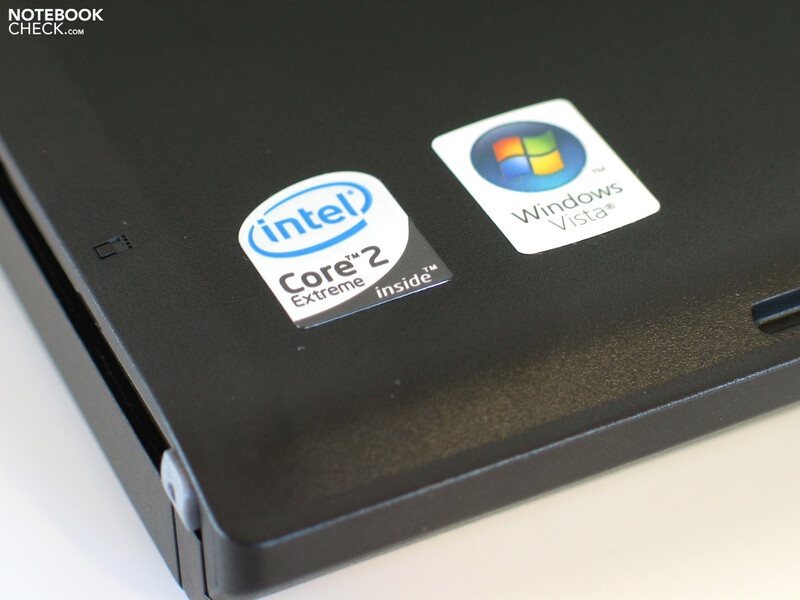 The W700ds doesn't show any weak points whatever in consideration of stability. Even the hinges of the considerably thicker display turned out equally sized. They can keep the massive screen, including the fold-out display, in place – although you have to count with a slight possible flapping. 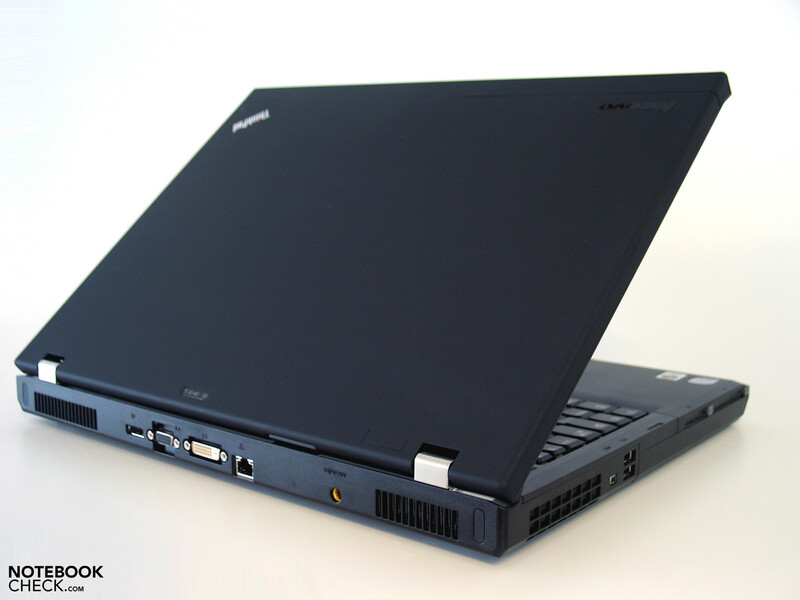 You have a bit more weight under your arm with the W700ds, which has a total weight of 5 kilograms. Of course, there are higher requirements set in a workstation in regards to the offered port options. 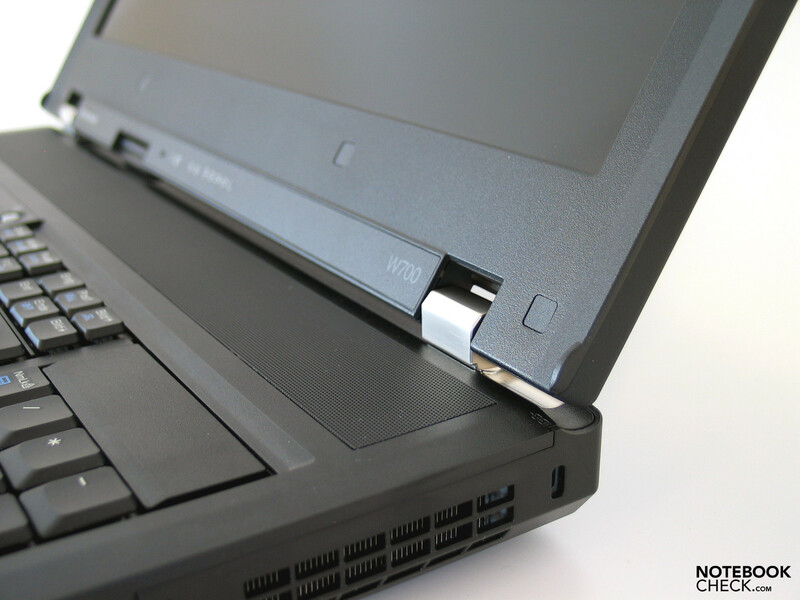 In this regard, a docking option is almost a must in order to extend the notebook with a docking station. 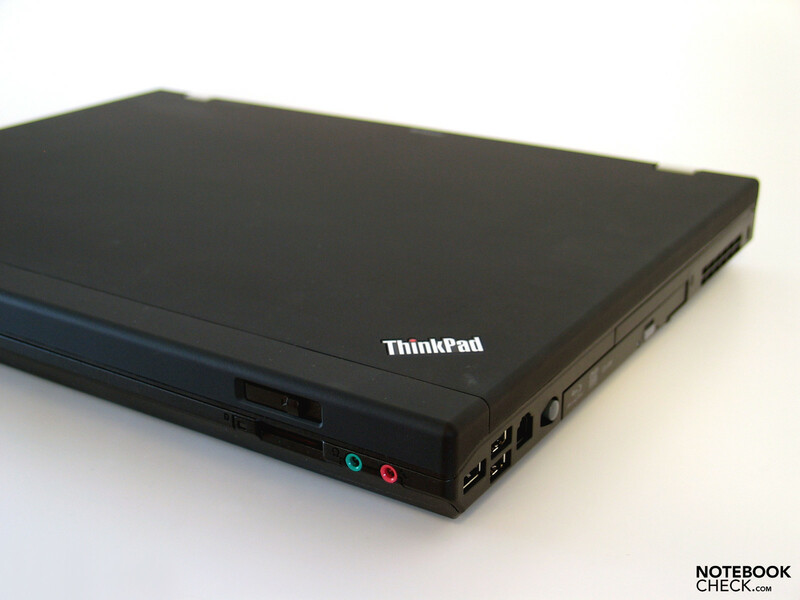 The Thinkpad W700 offers this possibility, too. 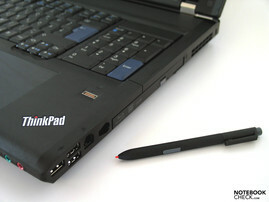 The Thinkpad is extended by 4 USB 2.0 ports with the W700 Minidock and the connections for the headphones, microphone, additional S/PDIF, VGA, DVI-D, display port and the power socket also drift to the back side of the notebook, letting the notebook be cleared of a lot of connected periphery devices, fast and easy. 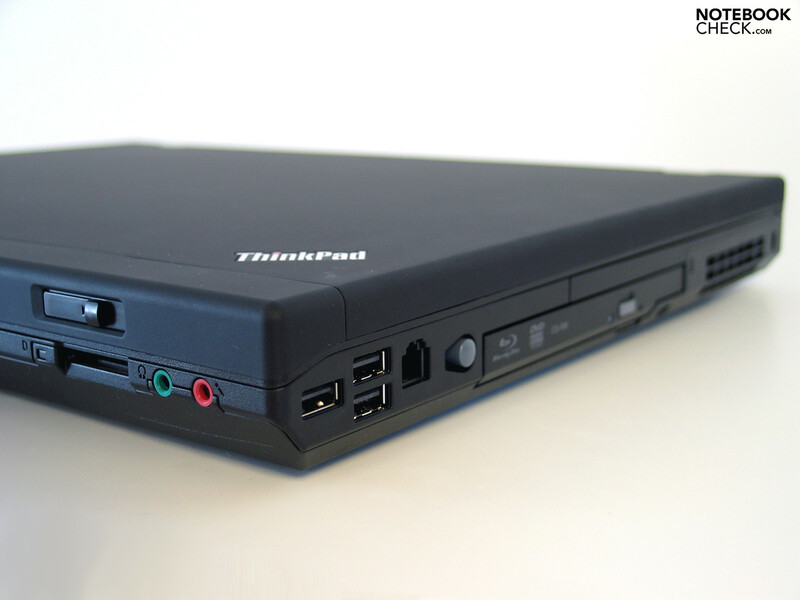 The price of about 200.00 Euros for the W700 Minidock can be added to the already proud retail price of the Thinkpad W700 starting at 2500.00 Euros (depending on the configuration, the price of our test sample: approx. 3500.00 Euros). The variant W700ds starts at about 4500.00 Euros. If you would like to mainly use the notebook mobile, or put up with the plugging and unplugging of the single devices, you should also come clear with the connectivity offered directly on the device. After all, there are 5 USB 2.0 ports, Firewire, VGA, DVI, display port, LAN and modem port offered. 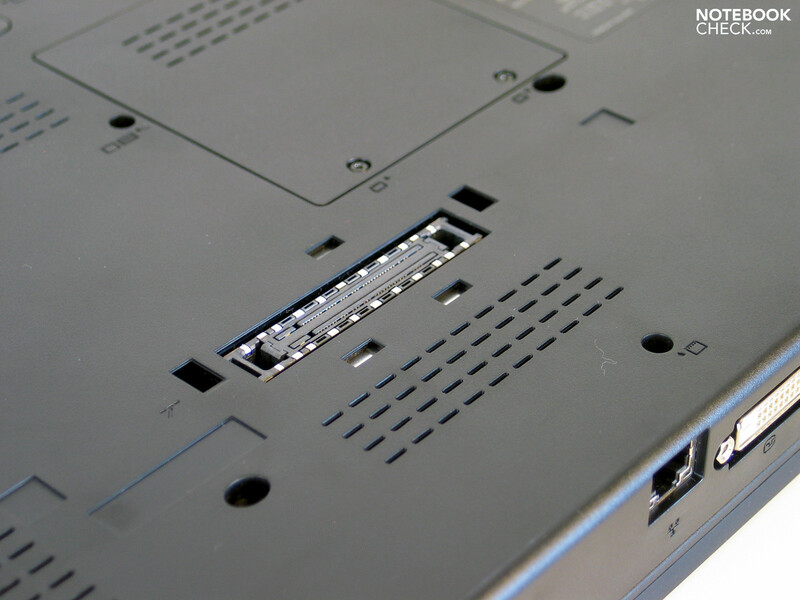 Apart from the 5 USB ports, the ports are found mostly in the back area of the device or on the back side. One or two further USB sockets would have been of advantage here, in order to also relocate a few permanently connected devices, like for instance a printer or a mouse, from the sides to the back. The configuration with a gigabit LAN interface (Intel 8256LM) is almost a matter of course in a caliber like the Thinkpad W700. Not a matter of course is the offer of an integrated modem, though. Merely a hand full of business notebooks still has this generally outdated option. A communication module could be helpful in countries with a bad bandwidth or UMTS coverage. A run of the mill telephone connection is found almost everywhere. 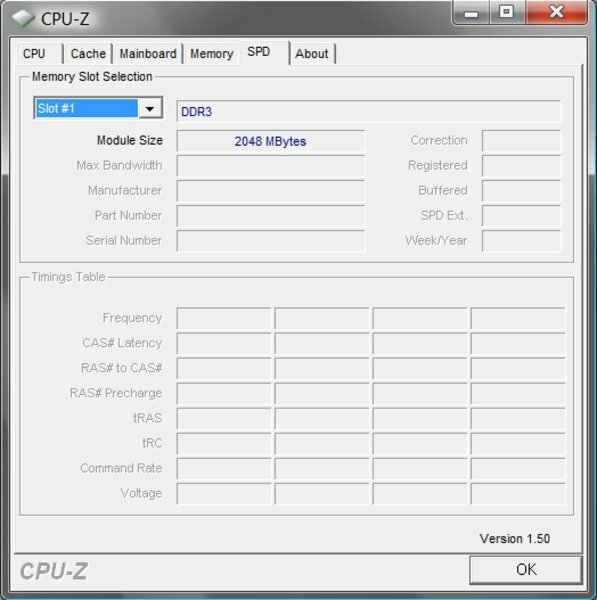 The wireless LAN standard a/b/g/n (Intel 5300 AGN) also belongs to the standard configuration of our test sample. According to Lenovo, an integrated UMTS broadband internet as well as wireless USB are optionally available. An extensive software package from Lenovo also counts to the standard equipment. This includes, for instance, the rescue of recovery tools, access connections, client security solution, The Thinkvantage utilities and a whole range of software more and programs, which help the user in many situations, and prepare tasks like, for instance, data protection, connections management, etc. user-friendly. 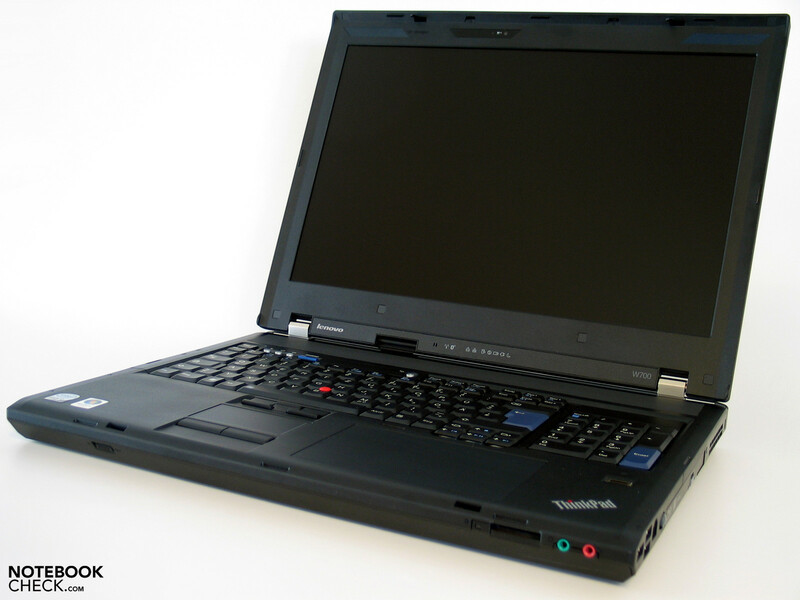 As all higher quality Thinkpad notebooks, the W700 comes with a 3 year basic warranty ex-factory. If desired, the "Bring in Service" can be extended to "On-Site Service". A surcharge of about 100.00 Euros has to be coughed up for the fitting ThinkPlus Service option. An upgrade to a 4 year warranty inclusive On-Site service is possible, too. The price: approx. 180.00 Euros. In any case, excluded from the extended warranty is the battery. Like most other manufacturers, Lenovo grants only one year guaranty on it. Available as operating system for the Lenovo Thinkpad W700 is either Windows Vista Business, or for XP fans, even Windows XP Professional. Thank-you, Lenovo. "What is would you desire? – We have everything!" No, we're not in a restaurant now, we're still talking about the Thinkpad W700, to be more precise about the offered input devices of the notebook. 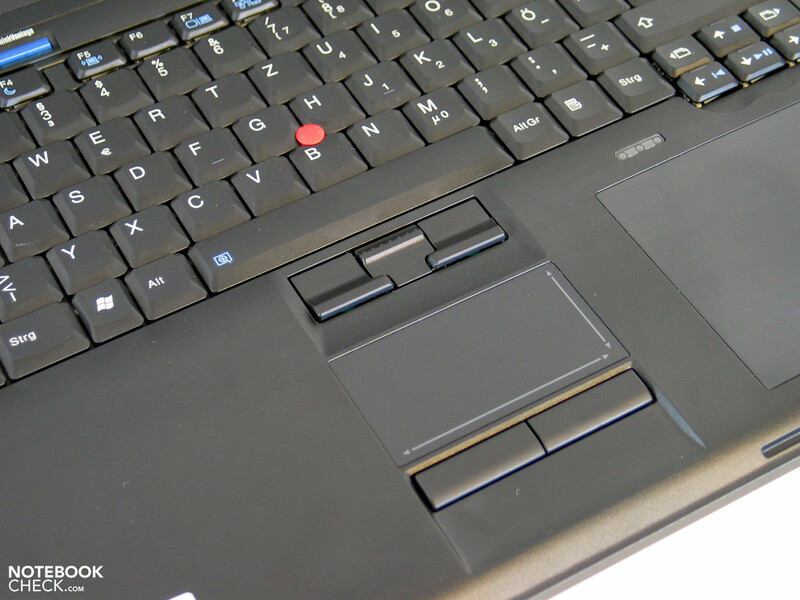 Besides the usual keyboard with an additional numeric block, you still find a trackpoint, like in all Thinkpad models, on the upper side of the base unit, a touchpad and as in the case of the W700, an integrated graphic tablet from Wacom in the appropriate configuration, as well. 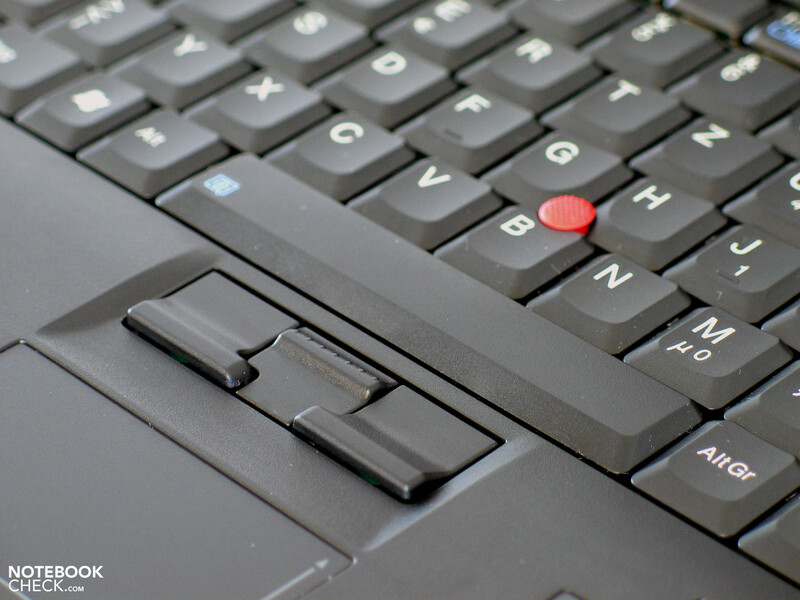 The applied keyboard is the standard keyboard device like it's also used in the bigger (14", 15") colleagues in the Thinkpad range. Above that, the W700 has also been treated to an independent numeric block, which will please especially graphic and CAD users, who are the primary target group of the W700. Inputting numeric data becomes cinch with its help. 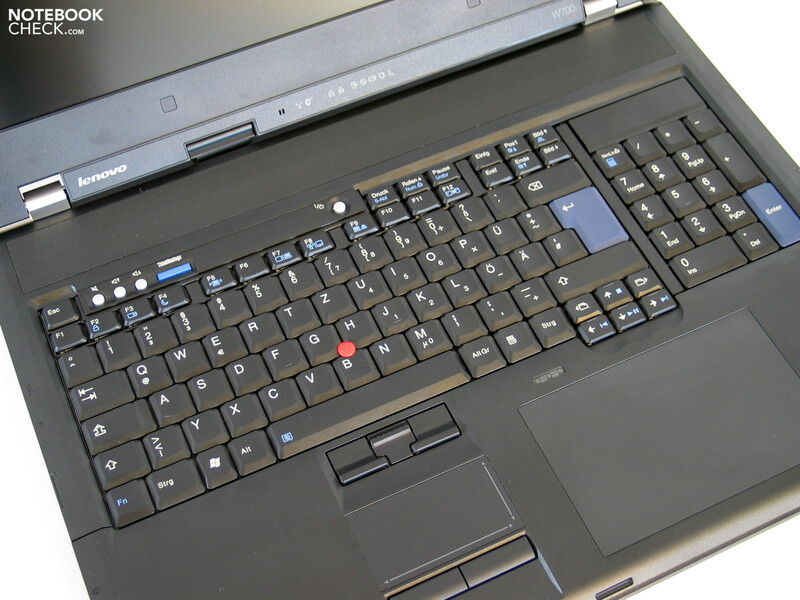 The typing quality of the given keys presents itself with the Thinkpad typical deeper stroke length on the one side and with the classic IBM layout on the other. This means that the FN and Strg keys traded places in comparison to common keyboards, though. On the other side, we encountered a few, in our opinion, unpromising traits of the W700 keyboard in our tests. This is the cause of a very loud noise at typing. Due to the keyboard not sitting absolutely firm in the case, it even clattered unpleasantly at vigorous typing. Too bad, that the W700 has such a flaw in this regard. We would have expected a bit more from the series' top model. Even an R50p keyboard still found in editorial use, which is already now an over 4 year old pro-device, but as the "low-priced" plastic edition, shows itself even after years of intensive use considerably more user-friendly and with a more pleasant type feel than the current keyboard of the W700 test sample at hand. Fortunately, they stayed loyal to the accustomed quality of trackpoint and touchpad. Both let themselves be employed perfectly and make even an unproblematic use of the notebook without an external mouse possible. 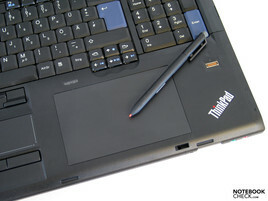 The Thinkpad W700 in the configuration at hand is equipped with a 120 x 80 mm sized Wacom graphic tablet including an appropriate pen. Lenovo didn't go in for any experiments but fell back on the tried hardware of the tablet-pros Wacom. In the test with Photoshop it quickly became evident that the pressure sensitivity of the pen point as well as the eraser has been set too low ex-factory, and too much pressure had to be applied for our taste, which led quickly to exhaustion. We weren't all too taken from the ergonomics of the pen, either, this resembling more a cheap freebie-pen than a high quality, precision work device. In our opinion, the tablet is very well suitable for on the go, an external input device should be favored at stationary use especially because of the better ergonomics, though. 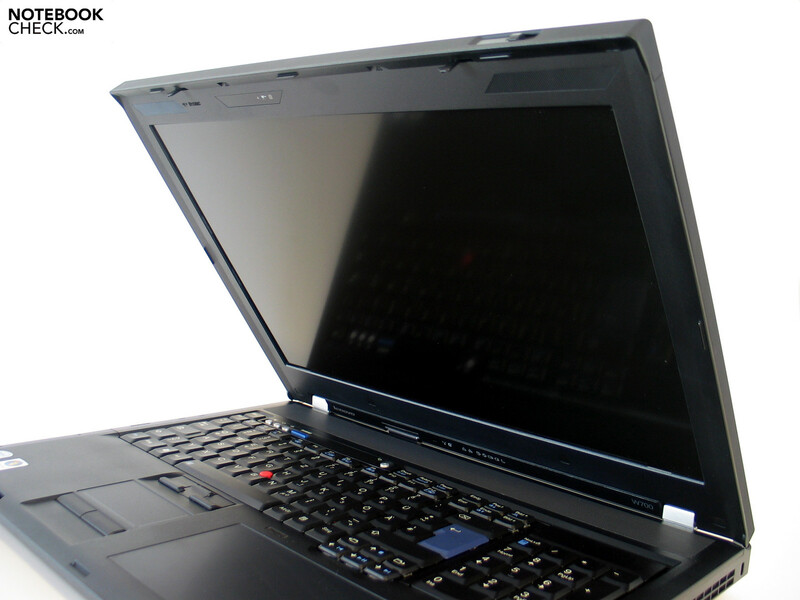 You will have to "accept" a 1920x1200 pixels resolutive WUXGA screen in the model variant Thinkpad W700. In the variant W700ds you come to enjoy an additional display, which with a diagonal of 10.6 inches (upright format) offers an additional work space of 768x1280 pixels. This could be especially interesting for graphic applications because you can, for example transfer the toolbox or different communication tools here and still have a complete display for the actual application. The maximum possible brightness of the primary display of our test sample had a good 265 cd/m2 in the right lower display quadrant. A very strong decrease of brightness at the side edges, especially on the left display side, of down to 178.4 cd/m2 was conspicuous, though. The shadowing in this area was even evident for the naked eye on a white display background. The very low illumination value of merely 67.3% confirmed this subjective impression. The screen achieved a good maximum contrast of up to 576:1 with a black value of 0.46 cd/m2. A further feature, which should make the Thinkpad especially attractive for graphic users: An integrated color calibrator is supposed to provide constantly for true colors; that is if you also use it. The calibration with the Pantone Color Sensor is very simple. Either, the user is reminded automatically within a preset interval about the calibration from the respective software or you start the program manually. After the start you are requested to close the display so that the integrated optical measuring unit in the base unit can detain the desired place to the display. The evaluation procedure is accompanied by "C64-type" Pacman sounds. After a triple peep-tone you can finally open the lid again and are affirmed with the usual before/after image of the necessity of the calibration. As a matter of fact, the presented image without calibration seems considerably to cool and almost bluish. The executed control measurements with our Spyder 3 Elite Colorimeter complied almost completely with that of the integrated measuring device. This should then be priced at about the same level as a custom colorimeter. The built in screen cut off all over good in comparison to low priced middle-field notebook screens. The presented color space is considerably larger and covers the RGB-color space almost completely. First the Adobe-RGB-color space asks too much of the built in display. In direct comparison with the high quality RGB-LED screen, already tested in the Dell Studio XPS 16, the difference especially to RGB-screens become very obvious, though. Their color space is again considerably over that of the built in display. Following is a visualization of the executed measurements. The correlating transparent color space is marked with a (t). The surface of the display turns out just as interesting. 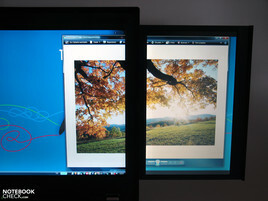 Lenovo sets on a mix of a matt business screen and a reflective multimedia display. The result is impressive. Unintentional reflections aren't completely omitted but are, especially at interior use of the notebook, kept very much within a frame. In return you come to enjoy very sharp images with vibrant colors. The given stable viewing angles of the display are sufficient for stationary use. Slight discrepancies are tolerated, but at further slanting it comes to the usual image distortions in form of shading or an over-irradiation of the screen. The retracted display lets itself be pulled out with a tip on it without problems and remains at disposal with a resolution of 1280x768 pixels. 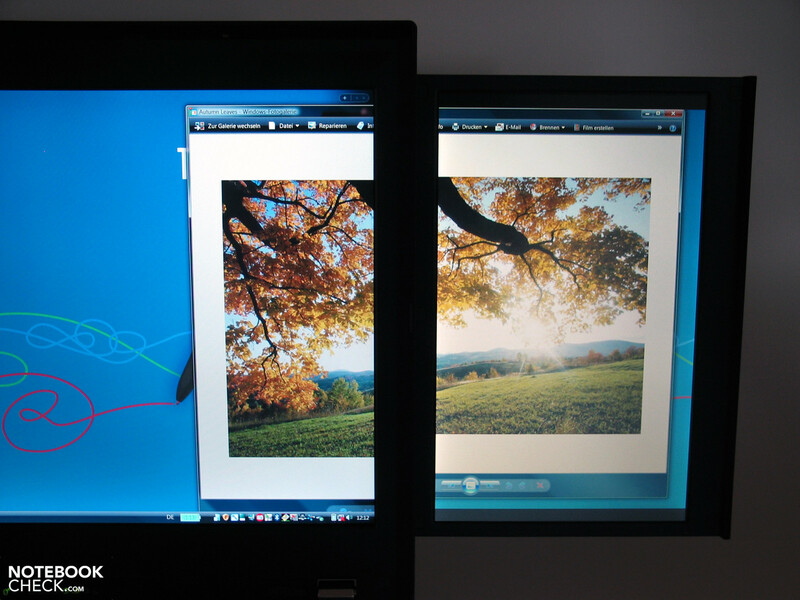 The desktop is automatically extended over the external display towards the right. After activation of the display you are informed that the use of an external monitor isn't possible with the fold-out display. A significant difference in the image quality between the primary display and the additional display becomes obvious with the naked eye. The colors seem matt and dull and black is presented more like a gray tone. Our measurements certify the display a sufficient average brightness of 168.8 cd/m2. The illumination of 84% is also okay. The catch is in the black value, which turns out very high with 2.23 cd/m2 and certifies the additional display a maximum possible contrast of merely 83:1. No wonder then that the image quality doesn't turn out very good. The viewing angle stability of the additional screen couldn't convince, either. This lets itself be folded inwardly to an extent; a noticeable darkening of the presented image at a not optimal viewing angle made reading the image partly a bit difficult. The screen is sufficient as a mobile substitute for a external display, but can't hold a candle to the image quality as well as the work surface of an sensible external monitor, even if it's just a low budget model. The additional display should also suffice for the uncomplicated use of placing various tools and tool boxes on it. The fold-out 10.6 inch display can't keep up with the primary display. 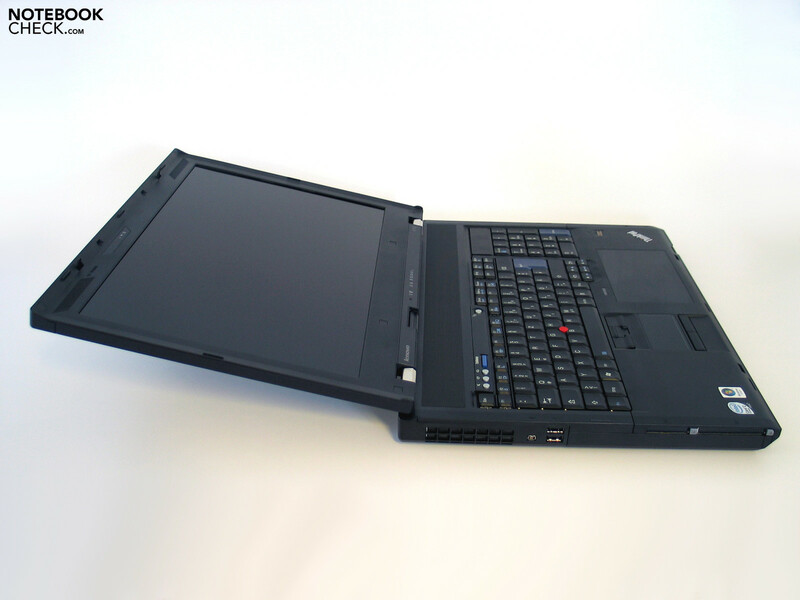 What, if not the currently most efficient components, would be awaited in a workstation like the Thinkpad W700? As a matter of fact, Lenovo isn't stingy with the W700 and offers the device with the strongest mobile components offered on the market at the moment. 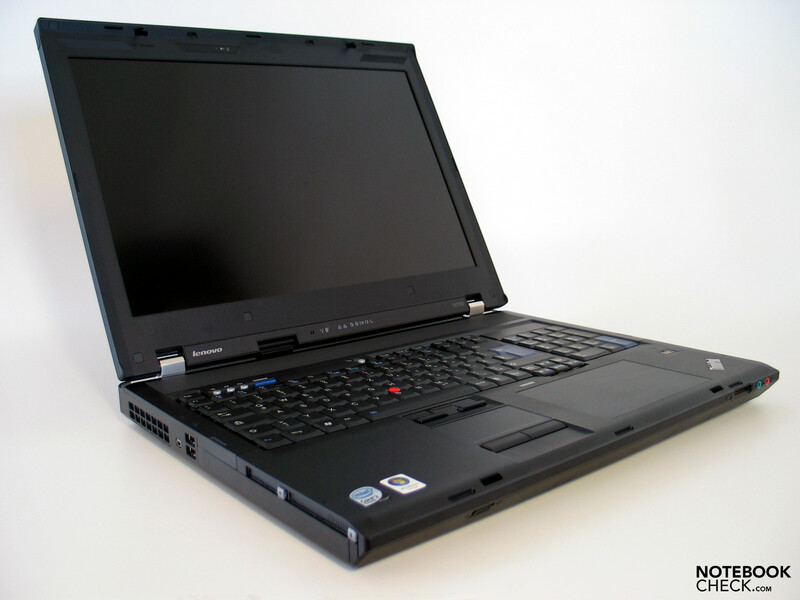 Of course, we accepted the offer thankfully and ordered a test sample equipped with a Core 2 Extreme QX9300 CPU and a Geforce FX 3700M, so to say the most exclusive and most expensive configuration variant of the Thinkpad W700. The Core 2 Extreme QX9300 CPU from Intel can score especially with its four processor cores for multicore-optimized applications. The Cinebench R10 benchmark test shows this impressively, or more precise the Multi-CPU Rendering test. 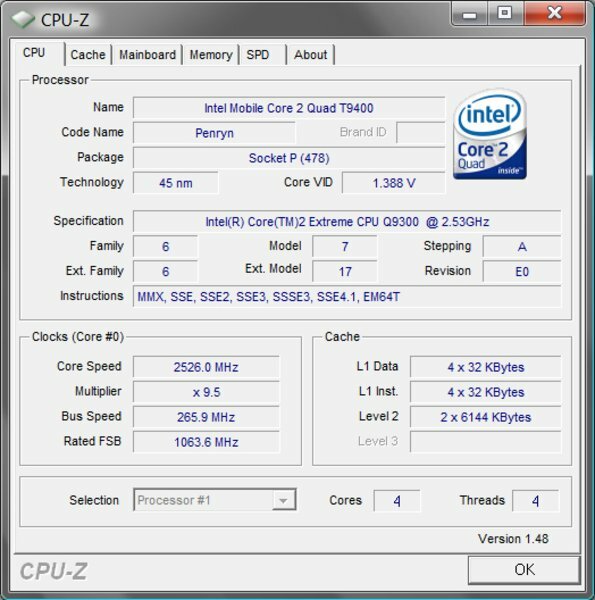 We could already observe that as before in many applications the CPU clock rate stands in the foreground in our Comparative Review of the Intel Core 2 Quad Notebook CPUs from Intel. Lenovo offers a fitting solution for this, too – the Core 2 Extreme X9100 CPU with 3.06 GHz. Very widespread (because it's cheaper) models are also the variants with Intel T9400 and T9600 CPU (2.53 GHz/2.8 GHz, each with two core chips). 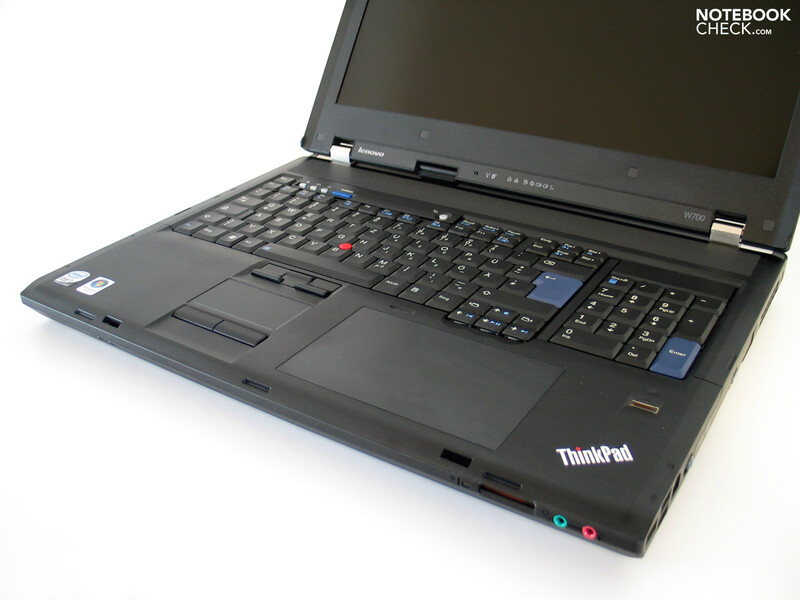 The PC Mark 2005 result certifies the Thinkpad W700 on the whole an excellent office performance. The workstation outpaces other efficient desktop replacement devices considerably with 7792 points. An important role is of course played from the whole package, including RAM and hard disk, in our case two fast 7200 hard disks and 4 GB DDR3 RAM. The architecture is also closely related to the current Geforce GTX 280M, which is also based on the G92 core but is manufactured in the 55 nanometer process (FX 3700 – 65 nm). 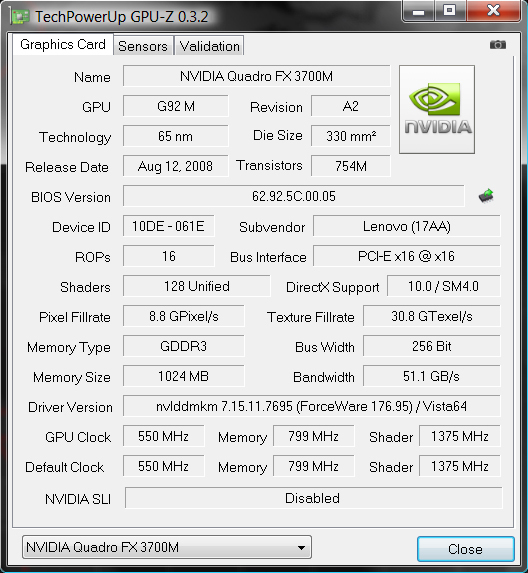 The alternately available, cheaper but also considerably less efficient Nvidia Quadro FX 2700M graphic chip, based on the Geforce 9700M GT graphic card, is like the FX 3700M equipped with special drivers, though, which trim the hardware towards stability and is optimized in particular for CAD and graphic applications. Surprising, but unfortunately not positively, is the result of the W700 with Quadro FX3700 graphic in the Cinebenceh R10 Shading test. The notebook achieved just 4481 points when rendering the OpenGL sequence and lines in on the level of an ATI RAdeon HD3650 with that. 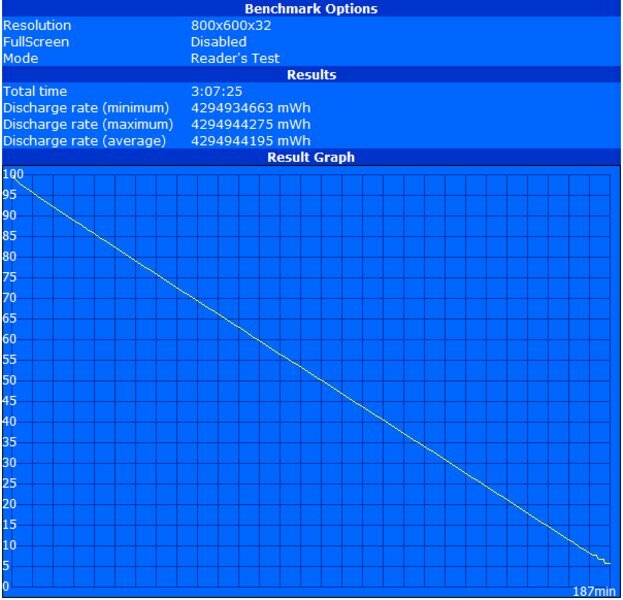 The already tested W500, equipped with an ATI FireGL V5700 graphic card, cut off considerably better with 5049 points. A control test with the W700ds (the same graphic card, Q9100 CPU) didn't bring an improvement. How the device really cuts off in practical use with your individual applications can only be reliably cleared through a test run in the end. The result of the system in the SPEC Viewperf benchmark also didn't really turn out magnificently, especially if you consider that the Quadro FX 3700M is supposed to belong to the efficient pro-graphic cards. The frame rate in the visualizations of the single graphic applications in the test stayed on the level of the Quadro FX 3600M and partly under the performance of the ATI FireGL V5700 graphic card (Maya, Solid Works). The test results of the W700ds were on a similar level. In the configuration at hand, the W700 showed two built in hard disks of the type Hitachi HTS722020K9SA00 with a gross capacity of 200 gigabytes each and a velocity of 7200 rpm. The disks showed an average transfer rate of 51.2 MB/sec and a lower access time of 15.1 milliseconds in the HDTune benchmark. 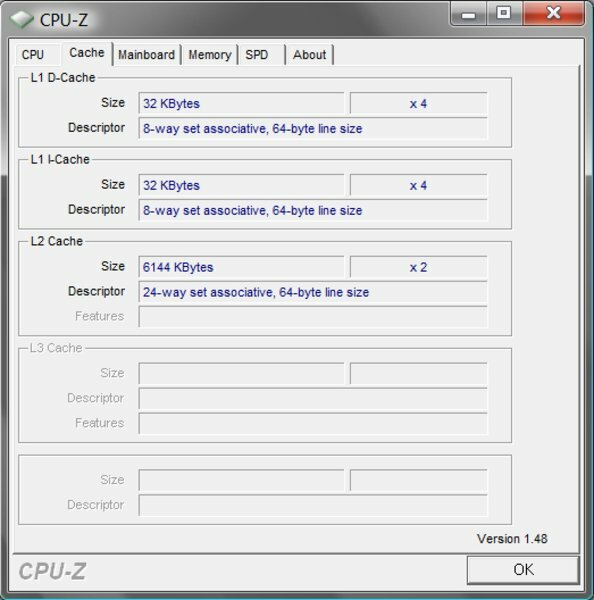 Equipped with two times 2GB RAM of the type DDR PC3-8500 our test sample reached the maximum possible storage allocation, at least if you stick to specs from Lenovo. The applied Intel PM45 chip set should support a maximum storage allocation with 8 gigabytes anyway, which can only be reached through the use of two 4 GB memory bars. 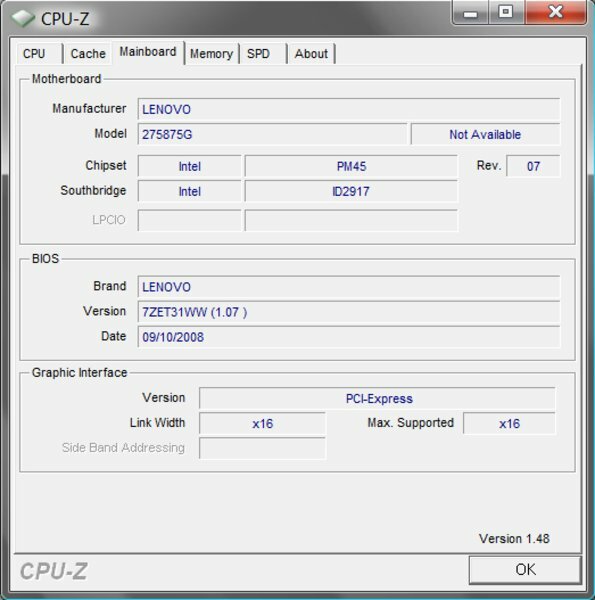 So that the whole memory is available under Windows in any case, our test model works with the 64-Bit version of Windows Vista Business. Because the performance of the Nvidia Quadro FX 3700M ought to be able to put itself on a level with a Geforce 9800M GTX, current games are naturally possible with the Thinkpad W700. How does it strike you to paint Liberty City red in GTA IV after a day's done work on your plans and visualizations? - No problem for the Lenovo W700. A good result of an average of 39.9 frames/second could be reached with the game integrated benchmark test at a resolution of 1024x768 pixels and medium details (viewing distance 21/100, detail distance 10/100, vehicle density 50/100, shadow density 8/16). In the game itself, the observed performance turned out less pleasing. 20 - 40 fps could be observed with the Fraps tool and short dropouts also occurred. The game itself was playable with these settings; a dropout at the wrong time would be lethal, especially in a hot pursuit or even combats. The only thing that can help here is a further reduction of the detail level. We also tested the real time strategy game Supreme Comander – Forged Alliance. The game was absolutely smoothly playable even at a higher detail level and a resolution of 1280x1024 pixels (anti-aliasing x2). Even bigger maps could be tackled without problems in a multiplayer game 3 vs. 3. 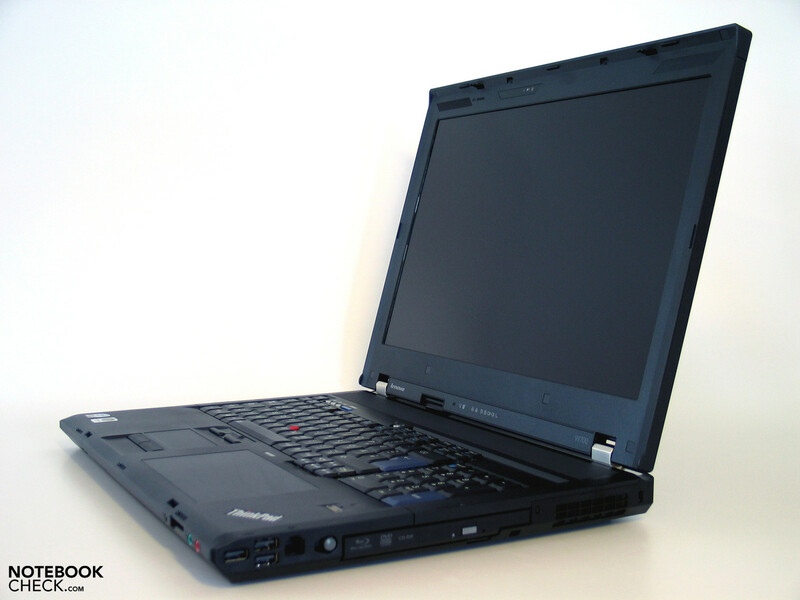 The Thinkpad W700 remained pleasantly silent at normal demand, despite the efficient hardware components. The fan just ran at a minimal level in unsophisticated office use or even in surfing in the internet causing a noise level of merely 31.5 dB(A). 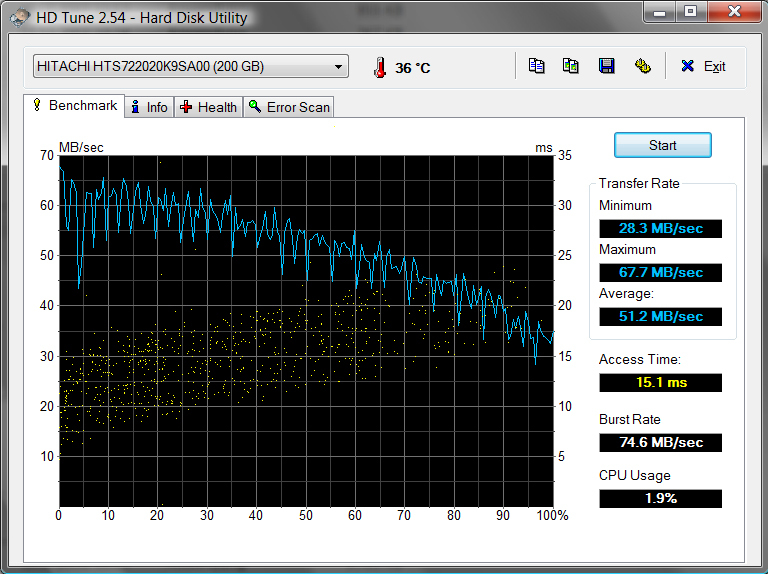 At a somewhat higher demand on the performance, the fan ran a bit faster for a short time and reached 33.5 dB(A) then. Subjectively, the soundscape can be described to be pleasantly quiet and can be characterized with a quiet acoustic noise, such as a stronger wind might cause. The workstation increased its volume under load but stayed at a perceived maximum value of 39.0 dB(A) in an absolutely unproblematic range. Even constant load shouldn't turn out to be a problem for the W700 and the ears of the user sitting in front of it. Who now thinks that the largest part of the rejected heat might be dispensed over the case is wrong. Our measurements didn't show any conspicuous results in regards to the surface temperature even after a few hours of load. The upper side reached a somewhat higher but still harmless temperature of 38.9°C in the right back quadrant. 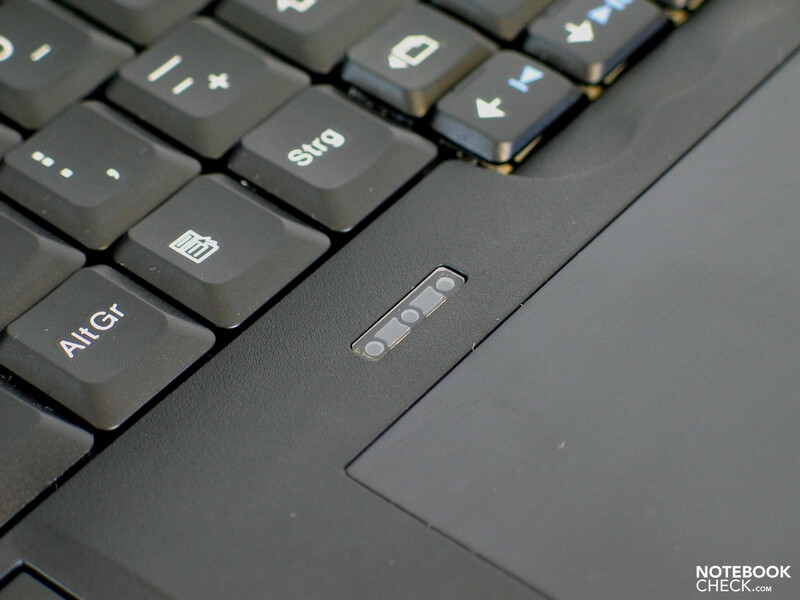 The keyboard never advanced beyond the 30°C mark.It doesn't look any different on the bottom side of the W700. This warmed up to an average of about 30°C with a maximum of a harmless 39.7°C. If your legs are sturdy enough, you can also use the device on your thighs, theoretically. (+) The average temperature for the upper side under maximal load is 28.2 °C / 83 F, compared to the average of 32.9 °C / 91 F for the devices in the class Gaming. (+) The maximum temperature on the upper side is 38.9 °C / 102 F, compared to the average of 39.3 °C / 103 F, ranging from 21.6 to 68.8 °C for the class Gaming. (+) The average temperature of the palmrest area of similar devices was 28.7 °C / 83.7 F (+3.5 °C / 6.3 F). Even if you can assume that most potential consumers couldn't care less about this point, we took a closer look at the built in speakers anyway. 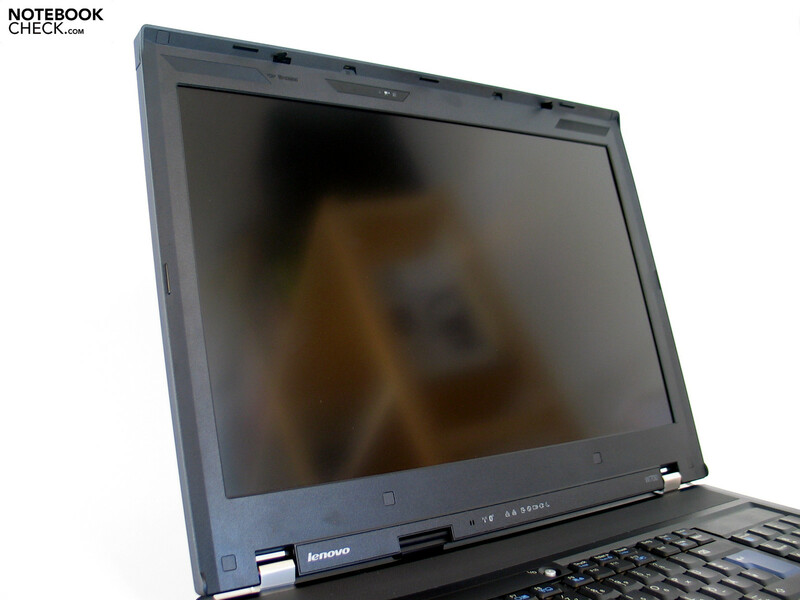 Two speakers have been placed under the perforated cover above the keyboard by Lenovo, which emit their sound very presently towards the user. There sound turned out, much to our surprise, very positive. The loudspeakers delivered a clean sound even at a good maximum volume, which are very well suitable for playing music titles. Nevertheless, a better and principally fuller sound was emitted over the signal of the offered headphone socket, provided that, of course, a high quality headphone was used, leaving nothing to be desired. 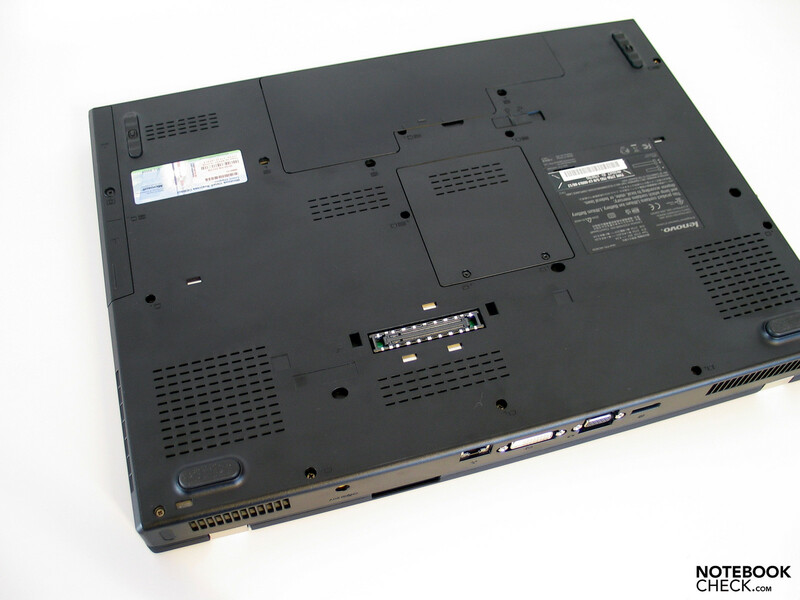 In order to give the very energy hungry W700 (maximum power consumption under load: 149.8 W) a passable battery runtime Lenovo equipped the notebook with a lithium-ion battery with a capacity of 84.2 Wh. The notebook reached a maximum to be awaited runtime in the BatteryEater Reader's test (minimum display brightness, energy savings mode, WLAN off) 187 minutes. The W700 achieved a runtime of merely 66 minutes in the BatteryEater Classic test, with maximal display brightness in the high performance profile, under load. Our test sample could still reach acceptable runtimes playing a DVD: 112 minutes at maximum display brightness in energy savings mode. The accomplished 140 minutes at maximum brightness in the practical WLAN use doesn't break any records, but suffices to bridge short time periods without a power socket. Almost solely due to the price design, the W700 comes into question practically exclusively for financially strong business customers. They can also take delight in the passably stable workmanship of the robust case for a long time. 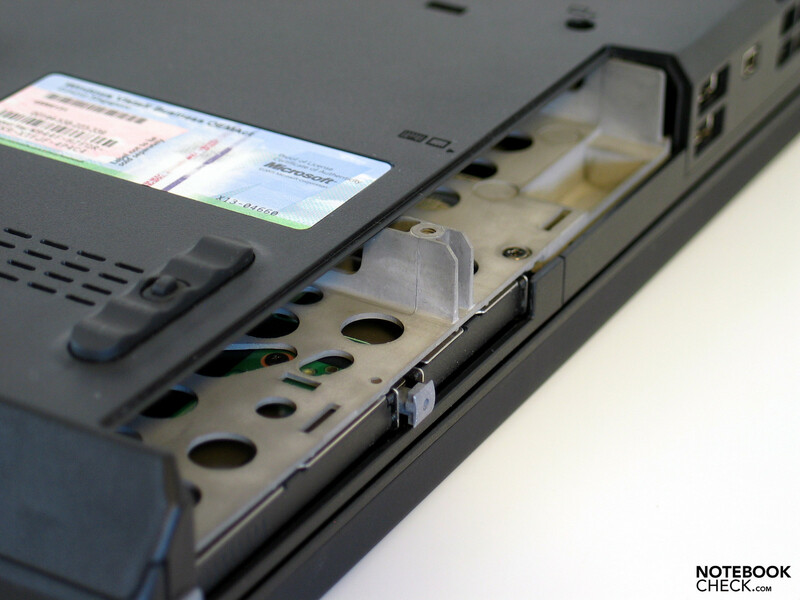 Unfortunately, with exception for the display lid, the surfaces of the W700 are made of plastic components. The feel of the notebook might not convince fully because of this, but in regards to stability it doesn't affect the device at all. 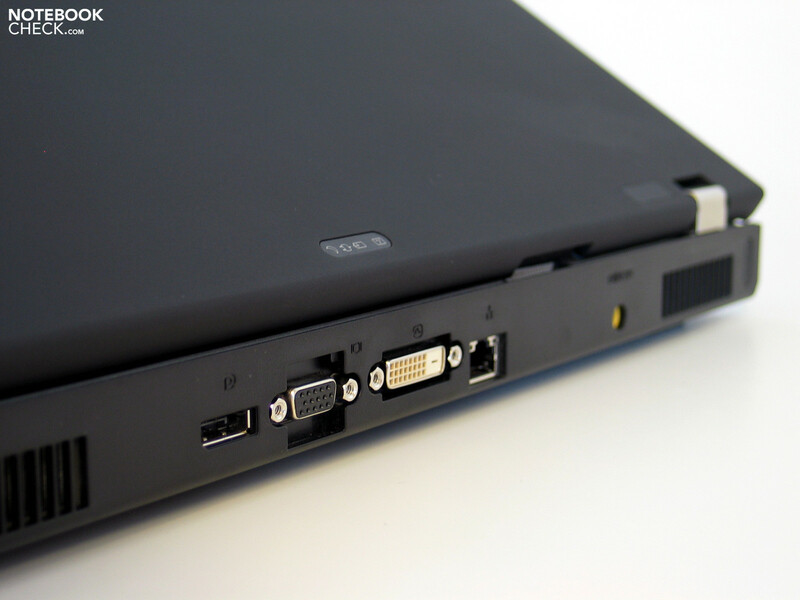 Almost all necessary ports are offered on the notebook itself. The user has to do only without an eSATA port. Nevertheless a fitting docking station is advisable because 3 of the total of 5 offered USB ports are on the far front of the side edge. 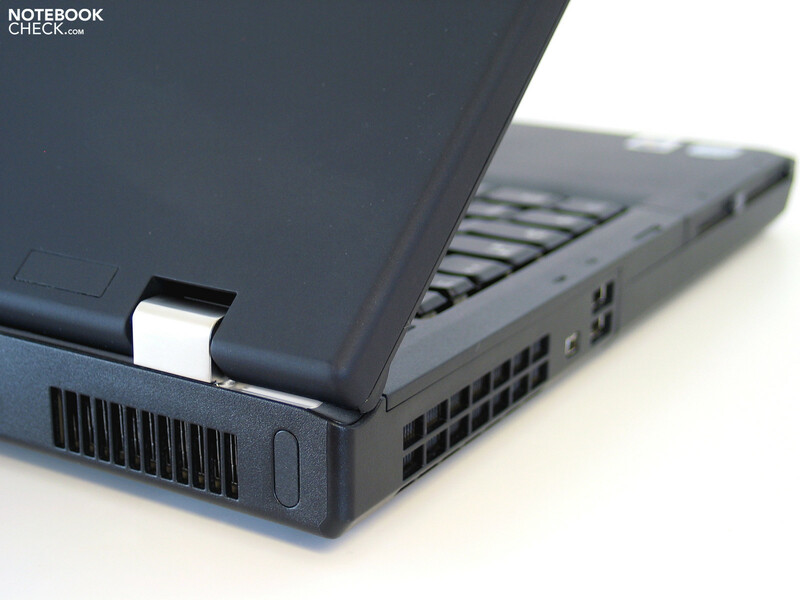 These, like all other connection alternatives, could then be concentrated on the back side of the notebook with support of a docking station and the notebook can quickly be detached from all connected devices. Unfortunately, we were surprised by a keyboard that didn't really convince in regards to the input devices. The familiar Thinkpad unit has been very well applied here but unfortunately, it isn't fitted tightly into the case, leading to clattering noises when typing. 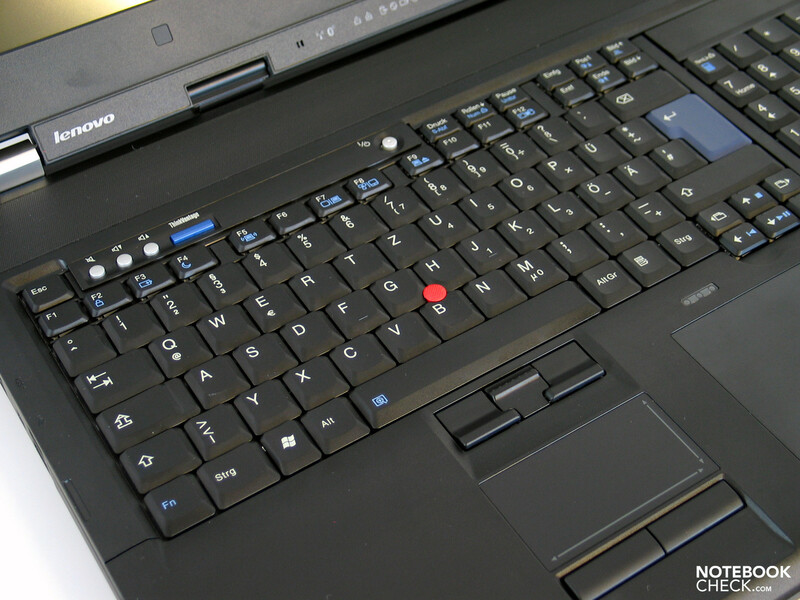 Lenovo offers the well-known good quality for the touchpad/trackpoint combination, though. The optionally integrated graphic tablet could be interesting for designers and CAD constructers, whereas external solutions do give a certain ergonomic advantage. 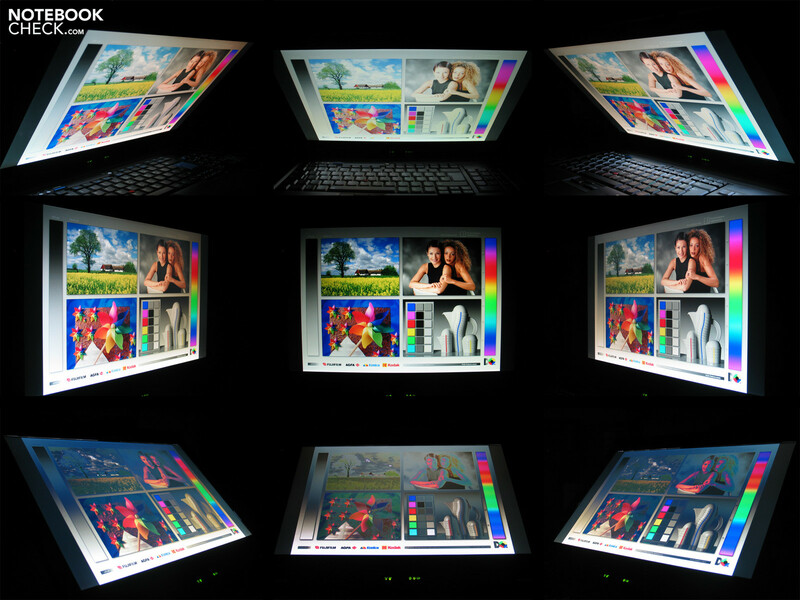 The applied display in a WUXGA format offers a maximum of work surface at good display brightness and good image contrast. 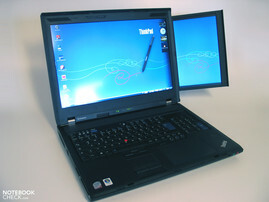 No, actually first the model W700ds bids a "real" maximum work space, having a fold-out 10.6 inch additional display. The display's surface finish also turns out interesting. A mix of glare multimedia screen and matt business display provide for a vibrant color presentation. Speaking of colors: The covered color space almost equals the RGB color space, and is therefore considerably better than in most common notebook displays. The W700 can't keep up with color pros with RGB-LED display, like for instance the Dell Studio XPS 16. 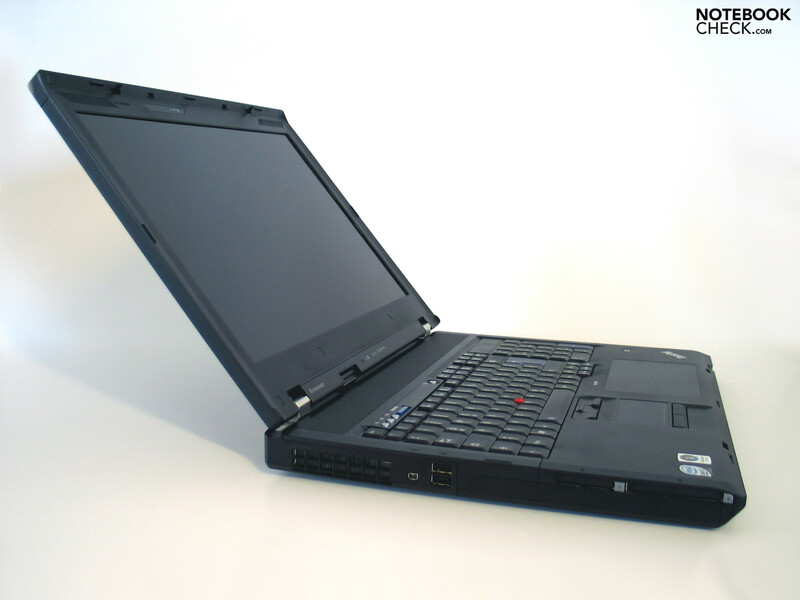 We wouldn't have expected anything else than a first class office performance from the Thinkpad W700 with the configuration at hand: Core 2 Extreme QX9300 CPU, Nvidia Quadro FX 3700M, 2x 200GB 7200 HDD and a total of 4GB DDR3 RAM. However, in the SPEC Viewperf benchmark test, the achieved results did stay partly somewhat behind our expectations. 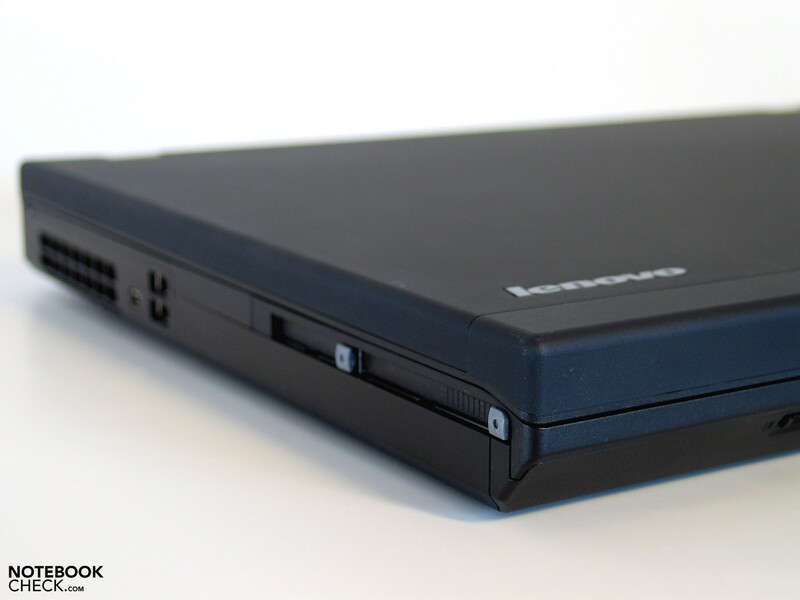 The Lenovo W700 could convince in regard to the emissions. A low system noise, it doesn't matter if in office mode or under load, as well as the low surface temperatures of the case make working with the notebook to a pleasure.The offered battery life is sufficient for short off the line interludes, but a desk with a power socket close at hand remains to be the favorite work place of the Lenovo Thinkpad W700. The Thinkpad W700 is currently the strongest vehicle in Lenovo's racing team. 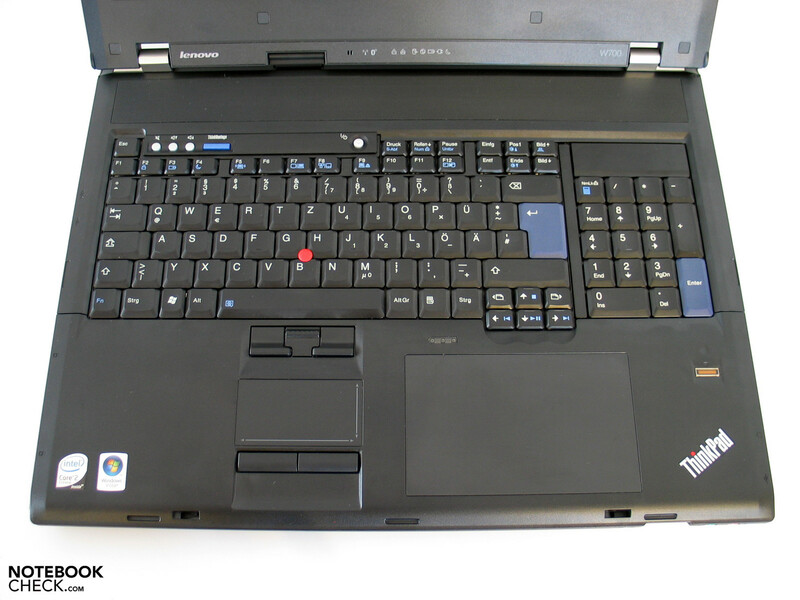 So you find a common Thinkpad keyboard unit in the device, which couldn't really convince. Besides that, the notebook has a separate numeric block for quick numerical input. 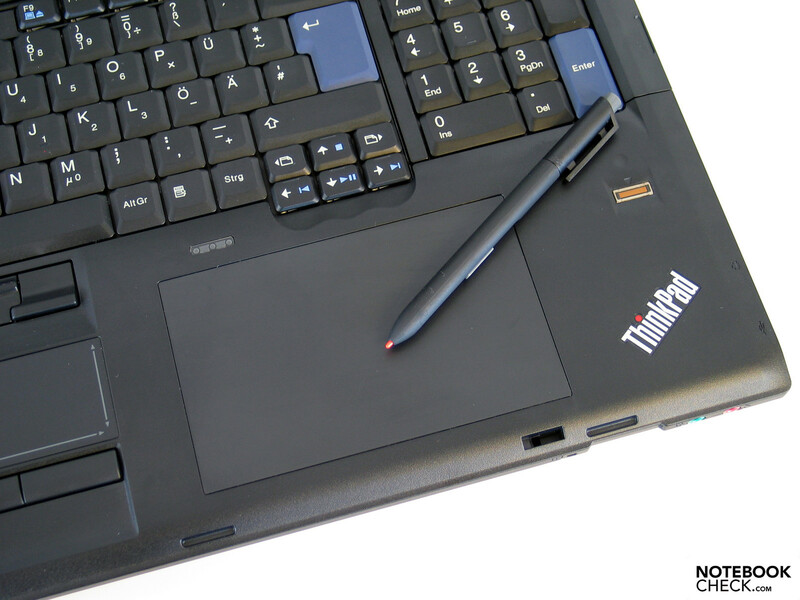 The W700 can also be equipped optionally with an integrated Wacom graphic tablet. The usual first-class qualities were offered from the combination of touchpad and trackpoint. 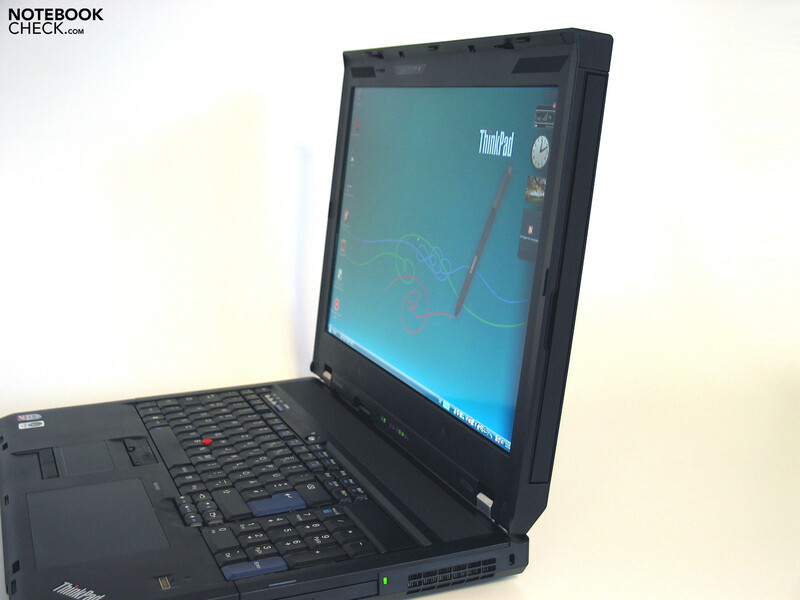 The W700's screen takes over, besides the display a row of other functions, also the reception of diverse antennas and the webcam or even the ThinkLights, for example. The notebook can be, also optionally, fitted with an integrated colorimeter, which grants a true color presentation. The display itself showed a good brightness with excellent contrast in the test. The display's surface finish turns out interesting, which is a mix of matt and glare screen. Lenovo isn't stingy when it comes to performance: A QX9300 Quad-Core CPU and a Nvidia Quadro FX 3700M graphic card provide for a decent propulsion. 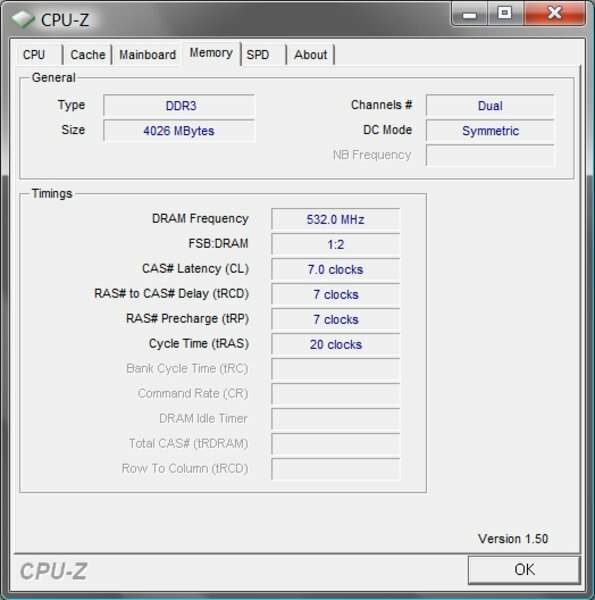 A 4GB fast DDR3 memory bar is applied in our test sample, in regards to the RAM. 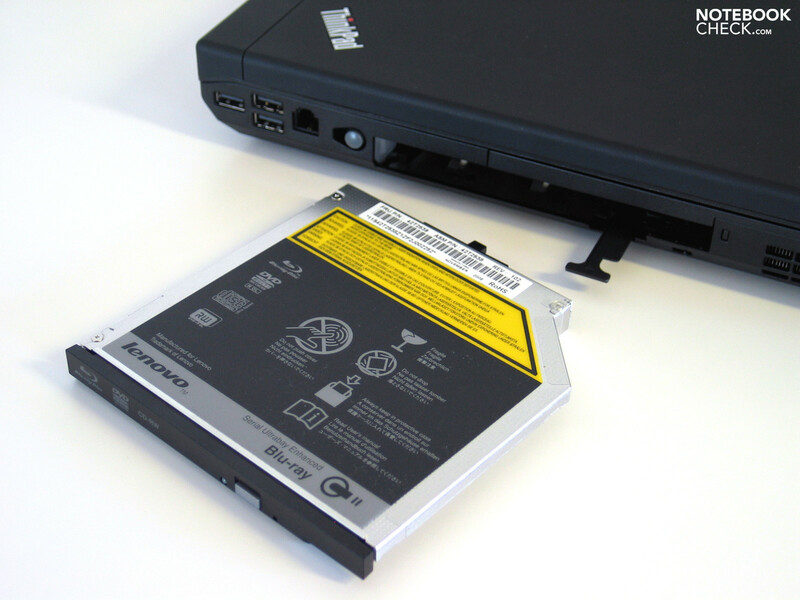 The Thinkpad W700 can also be configured with a decent storage capacity, having two drive shafts. The fan also coexists, one for the GPU and one for the processor. But the W700 stay surprisingly quiet in almost all modes of operation. The surface temperatures also stay very low, in view of the offered performance. 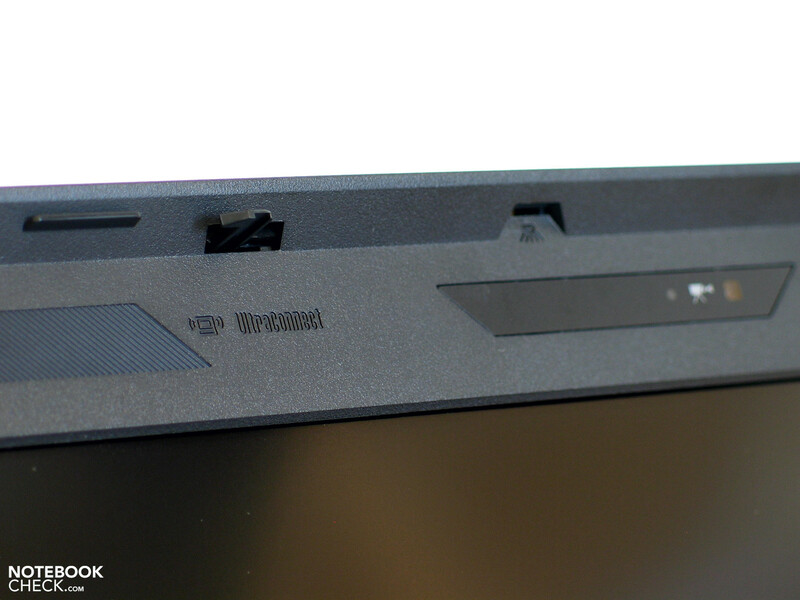 In regards to input devices, the Lenovo Thinkpad W700 has a whole row of possibilities. In the drive of the W700, an expensive Blu-Ray burner from Hitachi-LG is found. The giant is not only in view of performance but also in device measurements in a class of its own. The W700 brings approx. 4 kilograms or rather up to 5 kilograms (W700ds) on the scale, depending on the configuration. As usual, the Thinkpad W700's optic turns out conservative. The whole case is submerged in black, merely the red trackpoint provides for a colorful accent. The given stability turns out good, despite the primarily used plastic components on the surface. A stable magnesium frame in the inner of the device is responsible for this, which unites low weight with high stability. At the folding mechanism you meet the well-known massive metal hinges. These hold even the big 17 inch screen stably in place. First the W700ds with its particularly heavy screen bring the hinges to the limit of their capability. The ClamShell principal is also found once again in the W700 series. 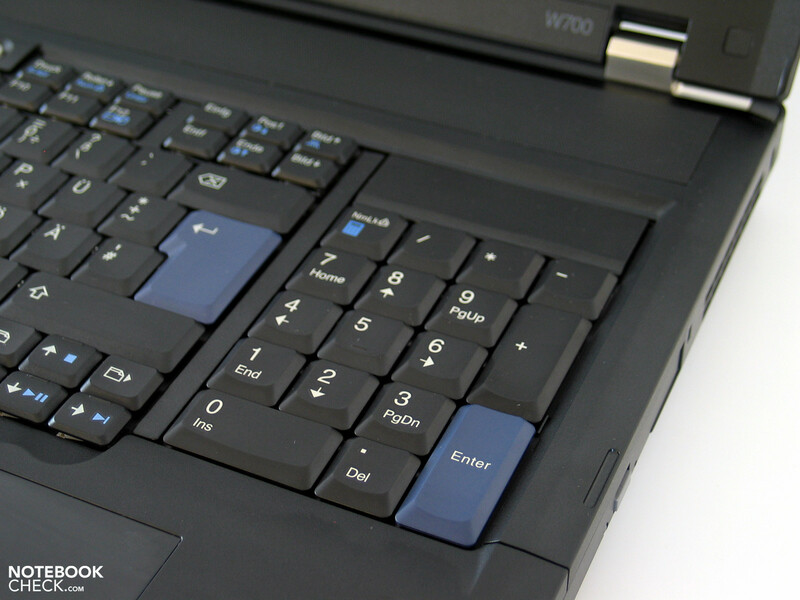 The W700 offers a row of connection possibilities directly on the notebook. ...as well as a VGA, DVI and a display port on the back side of the notebook. There is also a docking-port at hand on the bottom side of the device. 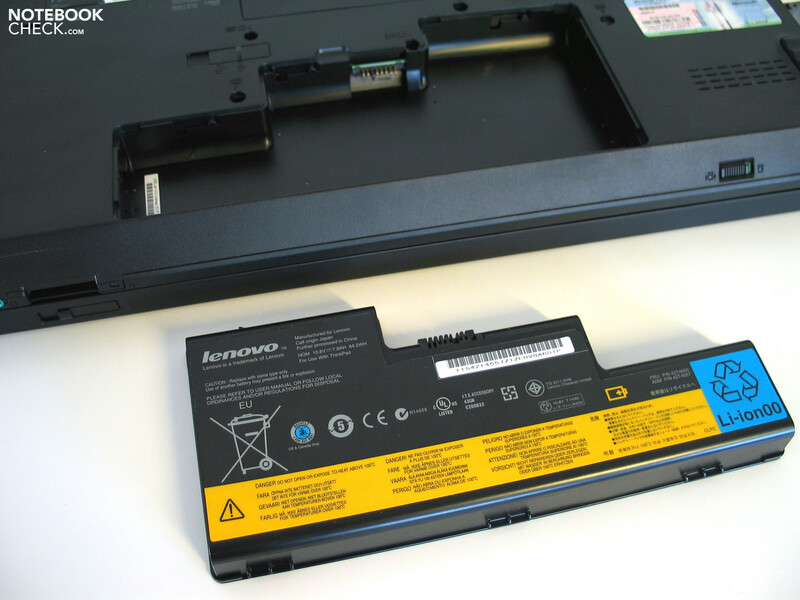 Because Lenovo equips the W700 with a particularly high capacity, rather reasonable battery runtimes could be reached. The "All in One" principle of the Thinkpad W700. It doesn't matter if a colorimeter, graphic tablet or external display – the W700 has united all of these peripheral devices in one notebook as a rule. That, apparently regardless of the high retail price of over 4000.00 Euros, there is a big demand for this high performance business machine. With a good business image: HP EliteBook 8730w, Dell Precision M6400; possibly the flossy barebones, for instance from Nexoc, Schenker Notebook, or Deviltech.